Another strong earthquake occurred late Sunday night in the far northern regions of the State. The offshore magnitude 6.9 temblor was widely felt from Roseburg and Medford in southern Oregon all the way to the Bay Area and beyond. Although no significant damage was reported on land within the first several hours of the quake, residents in Humboldt County felt the shaking for dozens of seconds. The quake struck at 10:18 pm. 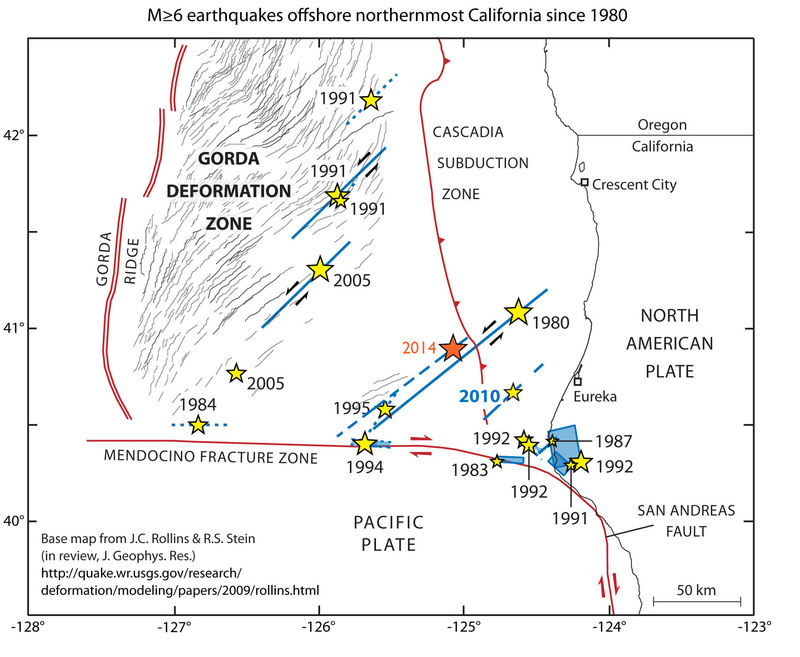 Its hypocenter was almost exactly 50 miles west of Eureka on what is known as the Gorda Plate. This small cousin of the Pacific Plate glides under the North American Plate in the Cascadia subduction zone. This very seismically active area reaches from Northern California all the way to the state of Washington. 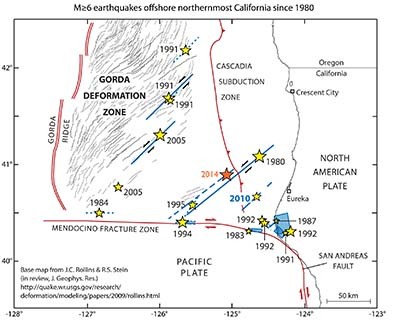 The boundary line between the Pacific Plate and the Gorda Plate west of Cape Mendocino is a fault similar to the San Andreas, variably called the Mendocino Transform Fault or the Mendocino Fracture Zone. It points from Cape Mendocino for several hundred miles straight west into the Pacific Ocean. Along this fault, the Gorda Plate slides horizontally to the east with respect to the Pacific Plate with a speed of about 2 inches per year.